A street vendor in Dalian China selling live seafood and algae is similar to those found in Asian live seafood markets in New York City and Boston. 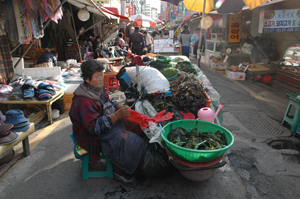 In Korea, sea squirts are grown for food and sold in the fresh seafood markets throughout the city. The sea squirts are used in a Korean dish [ Recipe ]. 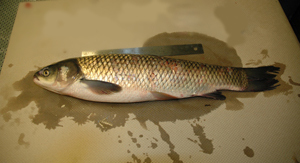 The grass carp or white amur (Ctenopharyngodon idella) is used to graze plants that grow in waters with other aquaculture carp species. Because it is considered invasive, it is prohibited from being sold in most New England states including Massachusetts, Maine, Connecticut, and New Hampshire. One pathway that introduces invaders into the environment, but has not received significant attention, is the live and fresh seafood industry. The live and fresh seafood vector involves both consumers and commercial vendors. Imported seafood enters the U.S. through 18 ports throughout the U.S., six of which are in the East Coast. Seafood refers to both freshwater and marine fish, invertebrates, and algae. Thus, live seafood is primarily fish, shellfish, and other organisms in tanks or water, bivalves on ice, and live algae, which if discarded into bodies of water may result in an introduction of that species (Weigle et al. 2005). We conducted a survey of species available in the live seafood markets in Boston and New York City, excluding species on ice in seafood stores and lobsters kept in tanks (supermarkets and seafood stores). Our limited survey indicated over 20 known non-native species, many of which have the potential to survive in the region if released. Released non-native seafood may become invasive in its new ecosystem, altering community structure and species composition, facilitating the introduction of hitchhikers, and spreading disease and parasites. Two examples of recently released food fish are the snakehead fish (Channa sp.) and the Chinese mitten crab (Eriocheir sinensis) (USDA APHIS 2006; USFWS 2002). The snakehead fish is a voracious predator that feeds on native fish populations. The Chinese mitten crab has the potential to destabilize levies and river banks, adding to flooding threats. Of particular concern are the discard of live or fresh seafood, such as oysters, mussels, and clams and other fish and shellfish from seafood markets along the coast. These species may have hitchhikers such as algae, small animals, larvae, and juvenile species associated with shells and carapaces as well as carry diseases that may infect new areas. One way to minimize the introduction of introduced species via the live seafood trade is to create outreach materials that raise public awareness on proper seafood handling and disposal and provide commercial dealers with information about the risks of introductions. However, many live seafood species are frequently purchased by populations who do not speak English fluently. To reach live seafood consumers who are not fluent in English, we have developed outreach brochures in a number of relevant languages, including Chinese, Khmer, Viet Namese, and Korean to reach the majority of Asian populations that purchase live seafood in the Northeast as well as English and Spanish. These are available at http://massbay.mit.edu/seafood/. If you purchase fresh or live seafood from seafood markets and supermarkets, do not discard anything into the waters. Of particular concern are oysters (they carry live organisms even after they have been sitting on ice for several days), bivalves that may carry parasites and diseases, crustaceans that are non-native (e.g. Dungeness crabs collected from Massachusetts Bay), and any live fish species. Chapman, J.W., T.W. Miller, and E.V. Coan. 2003. Live Seafood Species as Recipes for Invasion. Conservation Biology 17: 1386-1395. Clarke. 2006. Website may be a Source of Illegal Fish Imports. Practical Fishkeeping: March 6, 2006. [ Link ] Accessed: March 22, 2006. Cohen, A.N. and J.T. Carlton. 1997. 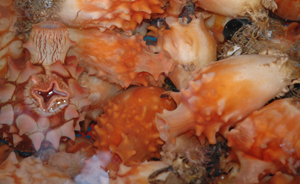 Transoceanic Transport Mechanisms: Introduction of the Chinese Mitten Crab, Eriocheir sinensis, to California. Pacific Science 51: 1-11. Connecticut DEP. 2005. Fisheries Division Licenses and Permits. Connecticut Department of Environmental Protection: June 6, 2005. [ Link ] Accessed: May 25, 2006. Costa-Pierce, B. 2003. Rapid Evolution of an Established Feral Tilapia (Oreochromis sp. ): The Need to Incorporate Invasion Science into Regulatory Structures. Biological Invasions 5: 71-84. Ewart, J.W. 1997. Live Shipping of Aquatic Products in the Northeastern Region: An Overview. In Proceedings of the International Conference on the Marketing & Shipping and Live Aquatic Products - '96, eds. J. B. Peters and B. Paust, pp. 252-257. Northeast Regional Agricultural Engineering Service. NRAES-107. [ Link ] Accessed: May 24, 2006. GAO. 2004. Food Safety: FDA's Imported Seafood Safety Program Shows Some Progress, but Further Improvements are Needed. Government Accountability Office: January 30, 2004. [ Link ] Accessed: May 26, 2006. Higbee, E. and K. Glassner-Shwayder. 2004. The Live food Fish Industry: New Challenges in Preventing the Introduction and Spread of Aquatic Invasive Species. Great Lakes Panel on Aquatic Nuisance Species ANS Update, Vol. 10, N. 2. [ Link ] Accessed: May 24, 2006. Lodge, D.M., S.L. Williams, H. MacIsaac, K. Hayes, B. Leung, S. Reichard, R.N. Mack, P.B. Moyle, M. Smith, D.A. Andow, J.T. Carlton, and A. McMichael. 2006. Position Paper of the Ecological Society of America- Biological Invasions: Recommendations for U.S. Policy and Management. MassWildlife. 2005. Keeping Captive/Exotic Wildlife. Massachusetts Department of Fish and Game: Fisheries and Wildlife: March 16, 2005. [ Link ] Accessed: May 25, 2006. Maine IFW. 2005. Unrestricted Fish and Wildlife Species. Maine Department of Inland Fisheries and Wildlife: November 30, 2005. [ Link ] Accessed: May 25, 2006. New Hampshire Fish and Game. 2004. Aquatic Nuisance Species In New Hampshire. New Hampshire Fish and Game Department. [ Link ] Accessed: May 25, 2006. New York DOS. 2004. Rule Making Activities. New York Department of State: Division of Environmental Conservation: April 21, 2004. [ Link ] Accessed: May 25, 2006. Rudnick, D.A., V. Chan and V.H. Resh. 2005b. Morphology and impacts of the burrows of the Chinese mitten crab, Eriocheir sinensis H. Milne Edwards (Decapoda, Grapsoidea), in South San Francisco Bay, California, U.S.A. Crustaceana 78(7): 787-807. Severinghaus, L.L., and L. Chi. 1999. Prayer Animal Release in Taiwan. Biological Conservation 89: 301-304. USFWS 2004. 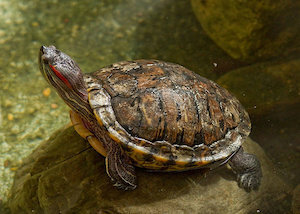 Importing and Exporting your Commercial Wildlife Shipment. U.S. Fish and Wildlife Service Office of Law Enforcement. [ Link ] Accessed: May 25, 2006. Weigle, S.M., L.D. Smith, J.T. Carlton, and J. Pederson (2005). Assessing the Risk of Introducing Exotic Species via the Live Marine Species Trade. Conservation Biology 19: 213-223.